Rabbi Levin's "Alternative" Commencement Address To Liberty University & Religious Remnant | RabbiLevin.com - Fighting for Morality! Expressing great sadness that Dr. Jerry Fallwell, Jr. invited presidential candidate, radical homosexual agenda advancer, Mitt Romney to Liberty University's graduation ceremony, Rabbi Levin issued an "alternative" address. Outlining Romney's record as the "political godfather" of same gender marriage. 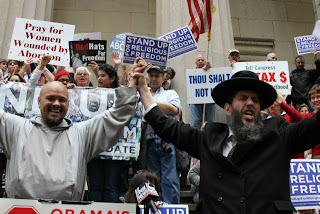 The Rabbi urges Fallwell, his students and the religious remnant to reject Romney and stand up for His eternal Torah family values! So now YouTube is labeling Orthodox Jewish beliefs and values "hate speech"? It's YouTube that is guilty of hate speech! I'm glad you reposted this video, sidestepping the evil YouTube after their censorship. It's great!